My two sons are really into the holidays this year. Last year my youngest was just too little to really understand what was going on around him and my oldest just wasn't interested. This year is a total 180. They had great fun picking out a little tree that they could place on a table and decorate all by themselves. Granted mommy did have to steer them away from the horribly tacky ornaments and towards a color scheme that would match the rest of my decorations. Then I had the task of explaining that since I was hosting Thanksgiving that the tree would have to wait to be put up until Friday morning. Needless to say that didn't go over too well. I think this might also be the last year for Santa with my oldest. He has made more than one hint that his friends have been talking about who the 'real Santa' is. I am very proud of him though for still keeping up appearances for his younger brother. It's the small gestures like these that make me happy that my kids have each other for brothers. So as Thanksgiving week begins I am very thankful for the fact that my family has each other and that my kids are turning into great little men. However, the one exception to their normally great behavior is food. When they were younger they ate anything. Then about 6 months ago everything began to change. Now they eat more than I would think would be possible for their size, but have also become very, very picky. Luckily they love chicken and it has become my fall back protein choice. 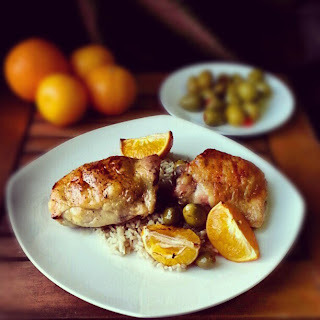 Recently I tried a new recipe for Roasted Chicken with Tangerines and Olives from Everyday Food magazine which looked very simple and full of protein. This recipe has 6 ingredients. It takes a total time of 50 minutes, 10 minutes of which is active and makes 4 servings. I had no problems finding any of the ingredients at my local grocery store. The one big modification that I made to this recipe is to use chicken thighs and drumsticks instead of a whole chicken. I absolutely hate butchering chickens. Any other type of meat I have no problems with, but chicken drives me crazy. Granted it would help if I had more disposable income and could afford the awesome knives that they have on all the cooking shows. As it is I have the knives that I can afford and even when I sharpen them before every use they are still not great for butchering chicken. So I took the easy way out and bought pre-packaged thighs and drumsticks. For the olives I used stuffed green olives. My two kids love pimentos and they are the easiest type of olive to find in my area, so I used them. Honey is a food that I am particular about. I always buy as local of a honey as I can find. My husband and two boys both have nasty allergies and the closer the honey the better. Luckily there are multiple local honey producers in the immediate area that I live, which is great. Finally, I allowed my chicken to cook slightly longer than the final 10 minutes suggested by the recipe. I prefer my skin to be crispy and well browned so I allowed an additional 5 minutes of baking time. I followed the remainder of the recipe as written. My two boys were big fans of this recipe. They loved the olives and ate the majority of the roasted tangerine slices. I liked that the recipe was very simple and had 53 grams of protein per serving. I try to make most of my family's dinners high in protein so this recipe was a perfect fit. If you aren't a fan of chicken skin this recipe would also work with skinned chicken. I would suggest keeping on the skin until the last ten minutes, then remove it and baste the meat with the honey and tangerine mixture. Overall a simple and sweet roasted chicken recipe. For the recipe go to Roasted Chicken with Tangerines and Olives. This looks delicious! I have all the ingredients already so maybe I will make this for dinner tomorrow! Thanks :) If you try the recipe tell me how it turns out!